Early May 1997… Tony Blair had just been elected Prime Minister, Princess Diana started knocking around with Dodi Fayed, Channel 5 was launched, Radiohead were about to release their seminal ‘OK Computer’ album while no one, ever, had heard of Kasabian, Brexit, Cheryl Cole, Troy Deeney or WIFC. On one count, that was all about to change. A year previously, a message was sent to the Watford mailing list, still in it’s own infancy, from a team representing QPR. They had taken part in a tournament called EuroNET ‘96, which was held in Nottingham. Graham Kelly, the then chief of the FA, was publicly sceptical about the ability of English football supporters to behave themselves during the Euro96, so through the use of Email lists and other internet based discussion groups, EuroNET had been organised to prove him wrong. 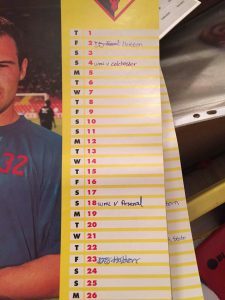 A game against QPR was organised by a Watford fan called Andy Barnard. Among those who volunteered to play were Aidy Spender and Simon Devon. The game was due to be played at Wormwood Scrubs around Christmas time, but the weather intervened and the game was called off. Before it had even started, WIFC had died on the vine and the trail went dead until a few months later, when another message was sent to WML asking if Watford were interested in entering a team into EuroNET ‘97. With Andy Barnard having moved to Tibilisi a new volunteer was required. Aidy was working and living in Essex during a year out from Uni, and he decided to take up the request. “I basically just mailed saying I was up for trying to put a team together and seeing who else was interested” says a modest Spender. From that small acorn, a mighty oak began to grow and a game against Colchester was arranged with the help of Simon Devon, who sorted a pitch at Hatfield Uni, where he was a student. Simon Devon’s calendar showing the dates that mattered..
Having suffered a postponement first time round, WIFC were now thwarted by the other bete noire of the amateur football team. “So we all met up and Colchester didn’t show” recalls Devon. “It was no real problem, as it at least meant we could meet each other and learn names this time! Among the people there that day were myself, Aidy, Mowen, Miles Jacobson, Julian Carrera, Paul Labbett, Jon Parry, ‘Dr’ Dave Perahia and Ian Lay.” Those players were to form the nucleus of the team that was entered into EuroNET ’97. With the tournament looming, games were needed and at the third attempt, WIFC finally got off the ground with a visit to Arsenal on Saturday 18th May 1997. The game was played on an astroturf pitch in Caledonian Road, Holloway and ended in a 1-5 reverse against a side that had been together for a few years by then. Julian Carrera had the honour of scoring the first WIFC goal while the team included those already noted, and also saw the WIFC bow of Pete Fincham, despite a car crash on route the venue. The first home game soon followed, as QPR travelled over to Hatfield on a windy day. Mowen scored a possibly wind-assisted 30 yarder, but QPR ran out 4-1 winners. WIFC finally notched a win against Fincham’s Sunday side, Headstone. Unfortunately, complete records weren’t kept at the time so the scorers in a 7-4 victory are lost in the addled memories of those involved. With preparations complete, the intrepid WIFC trailblazers set of for Middlesbrough, host of EuroNET ’97, in fine spirits. 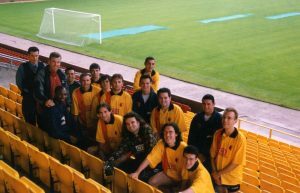 The first team picture – WIFC’s trail blazers in the Rookery Stand before Euronet 97.. This entry was posted in Club History by Dave Messenger. Bookmark the permalink.